RALEIGH, N.C. - July 27, 2017 - PRLog -- "You don't need everybody, just the right somebody...later y'all," says Relationship Solutionist Suzette Vearnon, signaling the end of another compelling interview for You Asked? Good Men Answered! Third Annual Virtual Summit. She's hosted the summit since 2015. This year's theme is "Behind The Mask: The Role Vs. The Real." 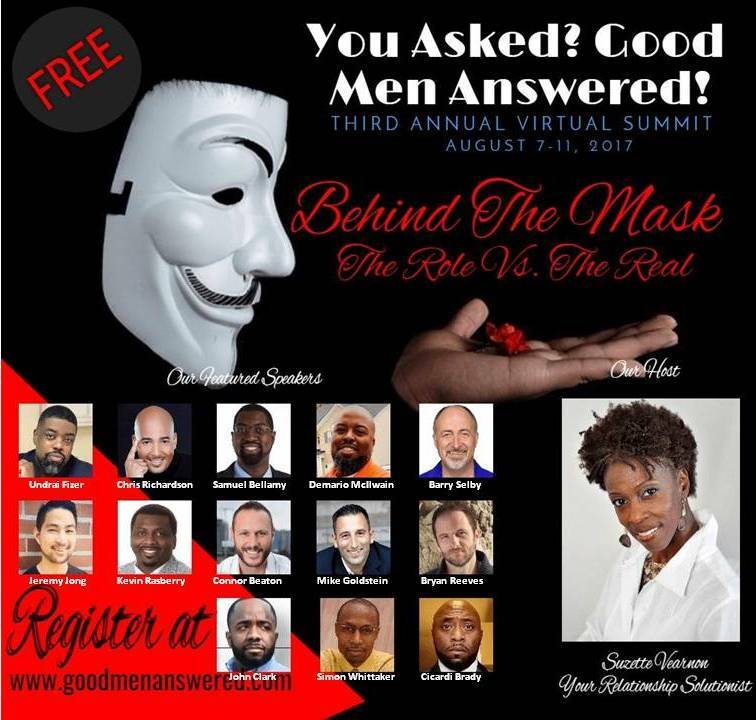 Thirteen relationship experts and regular guys expose the masks men wear in dating and relationships. • Chris Richardson, Best Selling Author, Dynamic Speaker and Radio Talk Show Host. • Samuel Bellamy, Healthcare Professional who also leads a mentoring organization for young men. • Undrai Fizer, Founder and Director of The Kairos Institute of Personal Discovery. • Demario McIlwain, Founder of JDS Certified Inc. and Strategy Director of Growgetter Digital. • Jeremy Jong, Men's Confidence Coach that empowers men to have confidence in love. • Barry Selby, Executive Coach and Relationship Attraction Expert. • Connor Beaton, Founder of ManTalks, with a background in opera and technology. • Simon Whittaker, a Relationship and Sexual Integrity coach. • John Clark, Owner and Operator of Couples Coaching & Individual Guidance LLC. • Kevin Rasberry, Best-selling Author of the self-help book, Decisions and Consequences-The Realities of Being a Man. • Mike Goldstein, #1 Online Expert in the country. • Bryan Reeves, Transformational Life and Relationship Coach. • Cicardi Brady, COO and Co-founder of Real Men Real Talk LLC. • Byron Benton, pastor of Berean Baptist Church Raleigh. • Jonathon Aslay, America's leading mid-life relationship Coach. • Mehrdad Moayedzadeh, Tony Robbins Results Coach and founder of Life Is Important Coaching. • Stephan Labossiere, certified relationship coach, a speaker and author. • Tem'Ti Sahu Ra, creator and matchmaking director at MeetMyTypes.com. • John Gray, author of Men Are From Mars, Women Are From Venusand internationally recognized expert. You Asked? Good Men Answered! Third Annual Virtual Summitkicks off August 7 - 11, 2017. You can dial in or web in. Most of all, it's free. Registration is required. Register now at www.suzettesolutions.com/optin2017. For 50 years, Suzette Vearnon brought her music and math mindset into everything she did. She felt without it, she would not have survived a childhood of emotional bankruptcy and the repeated offenses against her voice and her value that she allowed. As a pianist, Suzette always had an ear for music that tuned into what was off pitch and a mathematical mind that figured out what didn't add up. She began applying these music and math principles to her everyday life and discovered a higher vision, that music + math = a happy Suzette. Now it’s her passion to share these same principles with others. RALEIGH, N.C. - April 10, 2017 - PRLog -- Mention the words enough and factor and immediately the conversation shifts to April 14, 2017, the official kick off of "What Is Your Enough Factor?" City-to-City Tour. 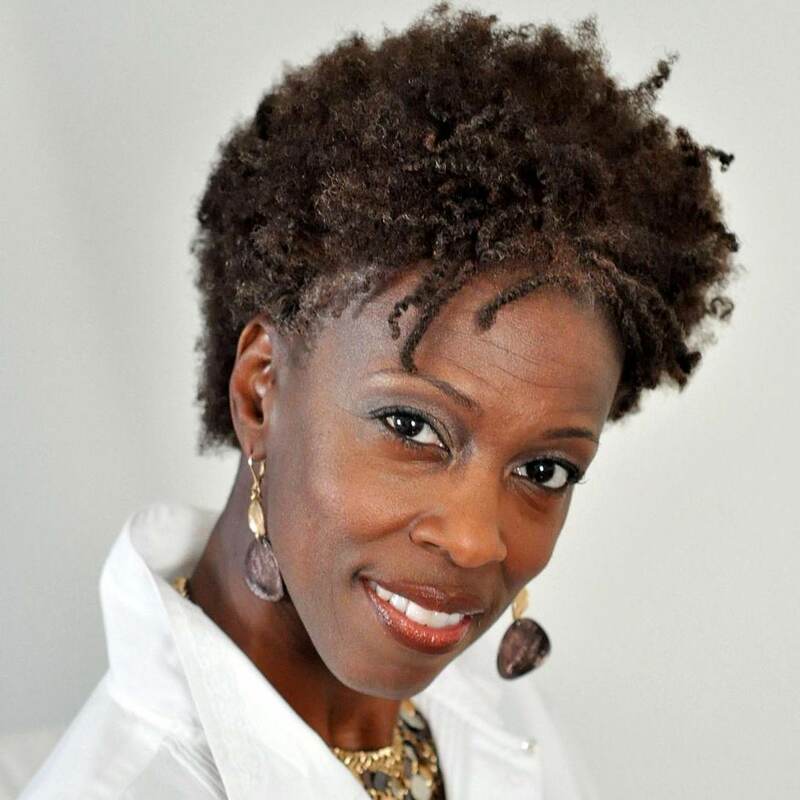 Beginning in Raleigh North Carolina, Gspot Author and Leader of Statistics Be Darned Suzette Vearnon will be crisscrossing the Raleigh-Durham area with one mission: To help women discover their super power to have great love. Says recently married Vearnon, "Your enough factor is as unique as your DNA and as coveted as The Hope Diamond, but few women know what theirs is." She adds, quick to offer further insight, "That's why women rely on somebody else's opinion; oftentimes turning their back on the very thing that makes them special." Statistics would never have predicted that this twice divorced magnet for emotionally unavailable men would find love at 50 years old. "They say the third's a charm," she says coyly, but is quick to point out that she had to do a lot of soul searching and self work for it to happen. A firm believer that great love is intentional, Vearnon offers relationship solutions to other high performing professional women like herself who desire true partnership but struggle in their relationships. "Folks that call me most are women who have had at least one divorce and subsequent unsuccessful relationships. They are movers and shakers publicly. But in their private lives, they suffer," she explains. But those aren't the only women who seek Vearnon out. "Sometimes women come to me because they have found someone and they need to bounce some things off me," she continues. "You see, they want to get it right this time." Whatever the reason, this Relationship Solutionist and Creator of the MusicMathTM Approach to relating is trusted to bring insight and offers an unconventional perspective that is revolutionizing how women see themselves and experience relationships. It's music and it's math. MusicMath, she calls it. "It takes both to have great love," she says, pointing to the music and math terms and symbols written all over the huge dry erase board in her office. For more about Suzette's cutting edge MusicMath approach and her fast approaching tour, go to her website, http://www.suzettesolutions.com/enough-factor. RALEIGH, N.C. - Feb. 13, 2017 - PRLog -- Four lucky women will have a special delivery of flowers delivered to their door. We talked with Suzette Vearnon, Leader of Statistics Be Darned's community of women and organizer of this event. Having gone through two divorces and a string of broken relationships, Vearnon knows very well how lonely Valentine's Day can be. "I don't want anyone to feel like I did," she explains as she recalls the emotional turmoil. "I felt overlooked. Left out. Like I didn't matter. If you didn't have a man, you were an outsider." Unfortunately, that is a feeling that single women won't have to endure this Valentine's Day. Statistics BeDarned and Odyssey Administrative Services, LLC will be redefining Valentine's Day as co-sponsors of "Celebrate A Single Sweetheart," an event that awards 4 women a special delivery to their door on Valentine's Day. "We just want single women out there to experience the joy of knowing that they matter. Someone sees them," says Vearnon. Over the past several weeks, men, women, boys and girls have nominated single women whom they respect and admire. For the woman to be eligible, she needed only to be over 30, not in a serious dating or committed relationship, living in the United States--and single, of course. This year's event includes another overlooked group of women, Straight Wives. These are women who have found themselves unknowingly married to gay men. For these women, Valentine's Day can be extremely difficult. Says Suzette, cohost of the Straight Wives Radio Show with Gay Husband Expert Bonnie Kaye and recovered Straight Wife herself, "What point is there to getting a card or some flowers from a man who doesn't even know you exist? It does absolutely nothing for you. In fact, it's insult to injury. I couldn't leave them out this year!" So on Valentine's Day at 6:00pm EST for one hour, women will gather from the East Coast to the West Coast to celebrate each other. The winners of the drawing will be announced. Says Vearnon, "There will be live drawings on the call too. And women will get a chance to shout out their BFF, family member, woman they admire. It's going to be great!" To join in, dial 712-775-7031 Access code: 156579 or type https://www.freeconferencecall.com/join/contact46into your browser. For more information, visit Statistics Be Darned at http://www.statisticsbedarned.com. RALEIGH, N.C. - Jan. 6, 2017 - PRLog -- Post election has brought many behind-closed-doors conversations as both heads of households and heads of small businesses ponder the impact to their bottom line. Ryan Ray, Chairman and CEO, Triangle Entrepreneurial Leadership, and Suzette Vearnon, President, Odyssey Administrative Services LLC have teamed up to offer a proactive option, inviting all to gather at The Center for Community Leadership, 711 Hillsborough Street, Raleigh NC 27603 on January 19, 2017. With the belief that everyone has something valuable to contribute, Ray and Vearnon will host Table Talks 2017 and The Entrepreneur Perspective. Here everyone who wishes to be more intentional about their spending will get information that will change their relationship with money. Ryan Ray will then lead The Entrepreneur Perspective, a monthly meeting for entrepreneurs. The topic for January is "The Ask/Need of Entrepreneurship." What participants can expect is education, hope and empowerment. Ray and Vearnon, both coaches, are quick to clarify what the gathering is and is not. Says Vearnon, "It is important that we deliver on our promise. I know what it's like to expect one thing but get something completely different." Ryan concurs and adds, "We want to offer them hope. So many folks have lost hope." While Table Talks 2017 is a free event, Dinner and The Entrepreneur Perspective will cost $10 in advance and $15 at the door. Advanced tickets can be purchased at: http://theentrepreneurperspective.eventbrite.com. For other questions contact Ryan Ray at http://telrtp.com or Suzette Vearnon at http://www.suzetterhinton.com.